The first sign that another celebrity is engaged, it’s plastered all over the news, blogs, and social media networks. Which celebrity has the most expensive engagement ring? Who has the most over the top, most expensive engagement ring? 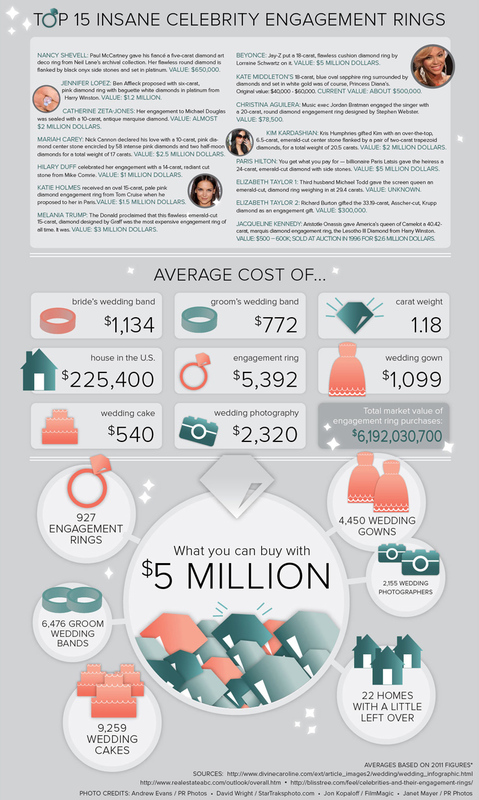 How do they compare to the average cost of an engagement ring? Find out below in these infographics! A simple solitaire diamond ring wasn’t always the tradition for an engagement ring. The tradition and style have dramatically changed throughout history. Which gemstone was popular before the diamond? What do the 4 C’s mean, for a diamond? Learn about them in this infographic below! This entry was posted in Jewelry, Jewelry History, Jewelry Tips and tagged engagement ring jewelry information, infographic, jewelry infographic, jewelry information. Bookmark the permalink.